We have a small recording studio at my place. 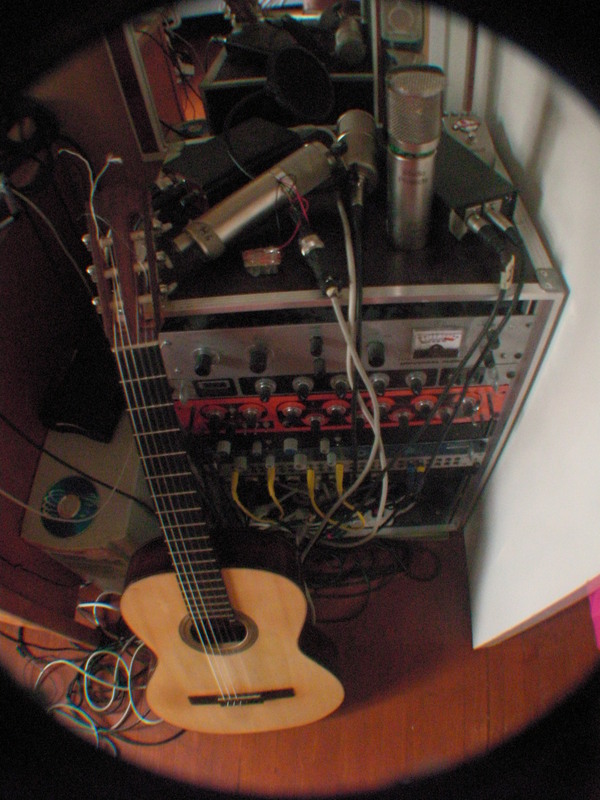 We have all these weird recording gizmos with wires and parts hanging all around. All of that is soldered together from weird old strange smelling electronic parts, some older than we are. We can’t afford top quality so we have to DIY our own quality. It’s not what most people consider professional but our philosophy is to make what it takes and we take it very seriously. Then we have a normal computer like the rest of the population. We record tracks that might be something useful and record some more stuff on top of it. We continue tracking till we think it sounds horribly too commercial and selloutish. Then Anna writes some lyrics and records the lead vocal track. Usually the icky syrupiness magically disappears and song actually starts to work (or sometimes not). I’ve tried to make songs by myself and invariably it ends up in an obsessive compulsive outbreak and I can’t let the song out of my hands till every millisecond of it is perfect. That seems to be a common trait among humans or at least among artists who try to make things by themselves. People tend to get more stupid in crowds and that’s a good thing in this scenario. Doing things together makes things also exponentially faster and funnier. There’s no hidden message in our music. What you hear is what you get. It’s hard to be yourself in this world but we’ve tried to get rid of all the pressure to be cool and professional. Still we are very serious about our music. It’s just that we try to be as honest as possible to ourselves and to the people listening to us. The cat is sleeping on the sofa, ignoring the whole world around it, except for the warm yellow August evening sunlight. It seems to me she has a deal with the sun, for sun always shines right on the spot where she is sleeping. She needs to save energy now, because there´ll be a lot of sneaking around when the night falls in a few hours. This cat loves shadows, warm nights, and she loves her top floor balcony with a view to all other creatures of the night. I now live with the cat, or at the cat´s, I´m only a visitor in her apartment in Poble Sec, Barcelona. The cat knows I have my first real holiday in many years, so I came here to see my brother. And the cat. These streets are full of sounds that are exotic to my ears: singing in the streets five floors below, kids having fun as they play games that I don´t know the rules to, even the modern music of traffic is different to Oulu. And now, here comes the problem. I was asked to tell about the new Bajo Cero song, “A Volar”, a song that was originally written for the Oulu Music Video Festival gala in 2008, the song we now have recorded and published in the Net. But my reality here and now in Barcelona is the total opposite of the imagery and world of this song (that I, personally, think is one of our best pieces). The world here is warm yellow, green in the mornings. But i´ll give you my best to describe the song and to open the door to her. A Volar is a world in dark blue, purple, even black with little fast shades of red here and there. It´s a dark night, possibly in august, maybe not, but there definitely is a forest, a big and thick one, trees that seem all blue in the little light there is, there might be mist any moment, you are alone. Almost. You´re not, for there is a bird, a black bird, maybe it is a crow. And you don´t know whether that is good or bad – all you know is that the bird is there. Watching you. Your journey in this forest has just began, but though you walk, you don´t seem to be getting anywhere. This is how I hear the song. Not scary, just dark. Go listen to it, close your eyes and use my template of imagery or make your own. Welcome to the brand new Bajo Cero blog, whoever and where ever you are! Starting today, thursday 12.8.2010 (on the same day that we play the only bar/club gig for this summer – see you all there) Bajo Cero will be publishing a blog post every week. This means that those of you who have been anxiously waiting to hear about Antti’s house renovation project or Okko’s desperation in search of the true essence of reality, you will get what you have been waiting for. For us, the band members, this will be a great opportunity to share a bit of what’s going on inside and outside our heads. This will be great personal therapy, especially during those months when you work your arse out to do music but nothing can be published yet. And I can tell you that many months like that have passed by now, for BC has been quite hyper active but almost invisible. That is the nature of creative work and work in the studio, 99% of the work happens behind the scenes. This leads us to another bit of news – good news for those who like us: New material will be published in our websites any day soon (free -as always). And terribly bad news for those that hate us but still read this blog: Today’s gig in Never Grow Old might be the only of its kind for this summer, but summer is over soon (hooray…) and Bajo Cero has quite a bunch of ideas for the autumn. See you this evening at the gig, or next week on this blog.